Welcome to another Tuesday review! As the summer heat started to descend into Battersea, our Comrade Helen hosted another fantastic MNFC gathering with pizza aplenty, and summer fruit dessert! Lets not mention the incidents with squirty cream. Oh, and how I accidentally cooled everyone off with exploding fizzy water, literally. But it could have been worse. It could have been gazpacho. Which brings us to the film in question, Women on the Verge of Nervous Breakthrough. It is a 1988 Spanish black comedy-drama film written and directed by Pedro Almodóvar, starring Carmen Maura and Antonio Banderas. Distraught by the break-up with her boyfriend Ivan, actress Pepa prepares a gazpacho laced with sleeping pills. She is however saved from suicide by her best friend Candela, a fugitive from justice. Thereafter, the story develops into a comedy melodrama and farce, where characters’ paths and back stories cross in ways reminiscent of Twelfth Night or A Midsummer’s Night Dream. In this interweaving narrative, there are strong nods to Hitchcock: in one scene when Pepa is sat outside Ivan’s apartment, she observes the residents through their open windows in a pure homage to Rear Window. And the whole film takes place with the vivid colour palette for which Almodóvar is so well-known. The works of Almodovar were of particular focus during a recent film studies course that I enrolled in at Imperial College, London, where we studied him as an example of a European Auteur. As demonstrated in Women on the Verge, his films often have strong female-centred leads, and he has been hailed as feminist. We had some discussion in our post-film analysis whether this could really be applied to Women on the Verge, given that all the events revolve around the actions of a man and the hysteria this creates in the female cast. But given it was the 1980s, the film I am sure would have been viewed as progressive at the time. Almodovar’s films stem from his involvement with La Movida Madrileña, which was a counter-culture movement of sexual liberation following the death of Franco in 1975. The early films made in this transition time were gaudy, bawdy and loud; celebrations of the country’s new-found social and sexual freedoms. Although many of his movies have developed darker themes, he continues to challenge gender and sexual roles, and social and national identities. Almodóvar places strong women centre-stage and demolishes weak male characters. It is a world where traditional gender distinctions no longer apply where women predominate and where no sexual choice is off-limits. For more insights into this director, and his work, he was recently interviewed for GQ magazine in this interesting article, appropriately titled “Girls on Film”. 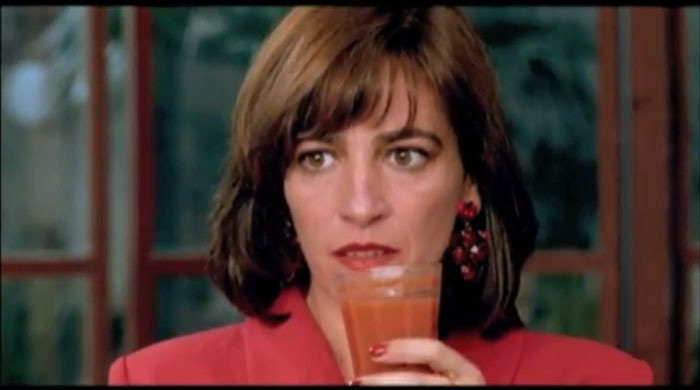 For those film clubbers who are particularly keen on finding out more regarding just how Almodovar used melodramatic narrative, (or more accurately, broke down melodrama), to highlight feminist themes, then click here. It seems that for every Tuesday Review, there is somewhere out there an essay which is waaaay geekier! As news comes that both Back to the Future and Groundhog day are soon to be made into stage musicals, it is no surprise that Women on the Verge, which lends itself so well to this genre, has already been made into one. And finally, here’s how to make the perfect Gazpacho. Just hold off the barbiturates, eh?